The first Channel crosing by balloon, 7 January 1785. The first Channel crossing by balloon, 7 January 1785. 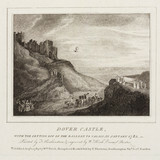 'Dover Castle from Charlton', Dover, Kent, 1846. Blanchard and Jeffries crosing the English Channel, 1785. 'Dover, From the Heights', Kent, 18 January 1847. Charles Green, English aeronaut, 1839.